Do you want to develop a good habit? Do that good thing every day for a month, …or so they say. It may be true, because I think my tapestry dabbling is turning into a habit. 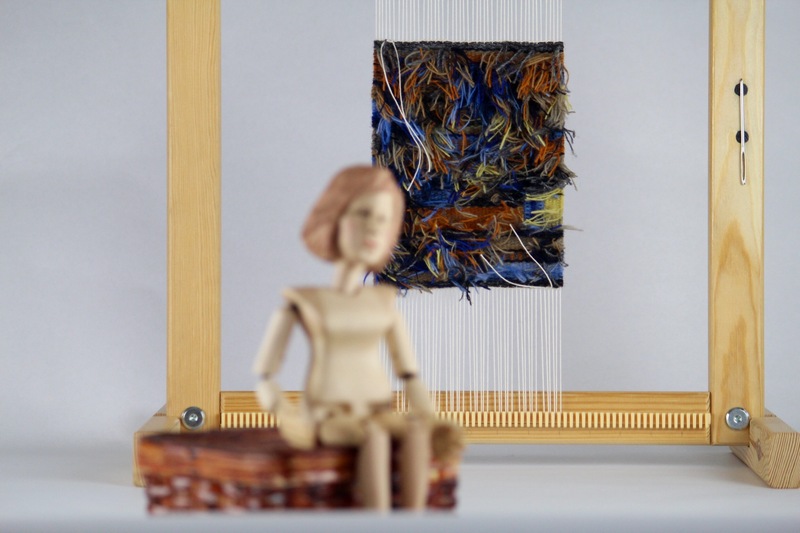 It seems perfectly natural, now, to end my day enjoying some peace and quiet with my little tapestry frame and a cup of tea. For the month of January, I completed a rectangular or square shape each day. February has no rectangles, only triangles and shapes with slanted sides. January 2015 is finished, and February is almost over. A tapestry dabbling diary is a simple way to mark the passage of time while letting ideas and images escape to become visible. Some of the photos include Steve’s amazing woodcarving handiwork. And be sure to check out the video at the end showing how I create a finished edging for this little January tapestry diary. Amos is heading somewhere, and will not be deterred. It is possible to be so focused on where you are going that you do not even see the “masterpiece” in the room? May you measure time with the good habits you develop. Linda, What do I use them for? Thank you for asking. That’s an excellent question. In fact, that may be a key to why I only dabble in tapestry. I really like making things that are useful, not just decorative. So far, they are practice pieces… I hope to continue these monthly little tapestries and somehow mount them (or some of them) in groupings for a wall display. I haven’t figured that part out yet. Did your husband carve Amos? He is fantastic! The tapestry is a nice piece too. I like your color palette. Yes, my husband did that carving of Amos. 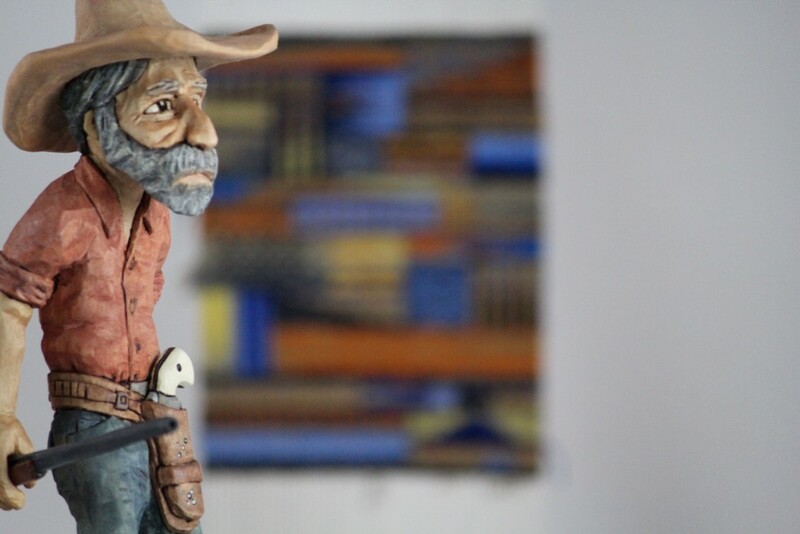 I like the way he painted the figure, too, as well as the carving. Yep, Steve is pretty good at this. I’m glad you like the tapestry color palette. I really enjoy choosing the colors for something like this. 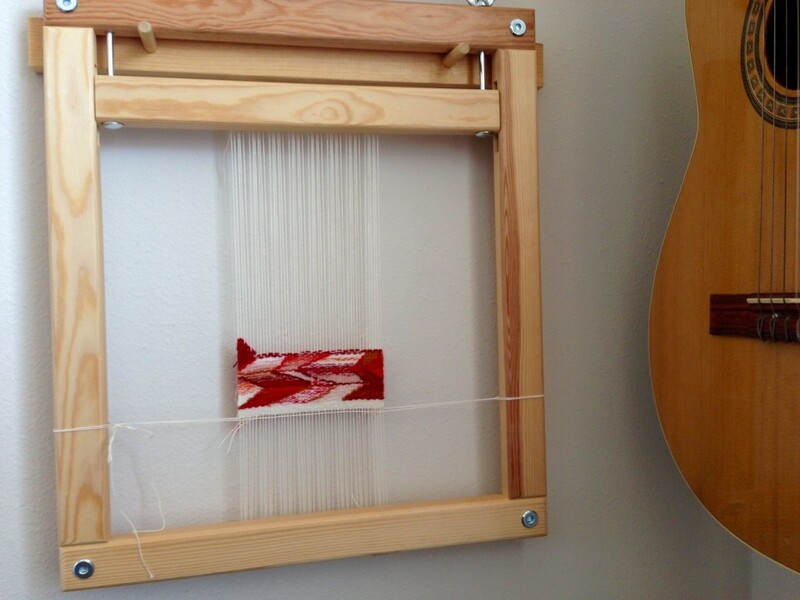 As a classically trained musician, I tend to approach my time at the loom as practice. This means being mentally alert–for every little gesture, the synchronization of movements, and the quality being produced. Little by little, with this mindfulness, I see improvement in releasing and catching the shuttle, treading my feet on the treadles, and efficiency of movement overall. I still struggle with getting an even beat and with keeping my place in the treadling pattern. My pace of weaving is increasing, though. Hemstitching begins another cotton lace scarf. The ease of weaving with only one shuttle allows ample opportunity to focus on improvement of weaving technique. Will I ever reach perfection in these skills? I don’t think so. I have come a long way, but have you noticed that learning never ends? 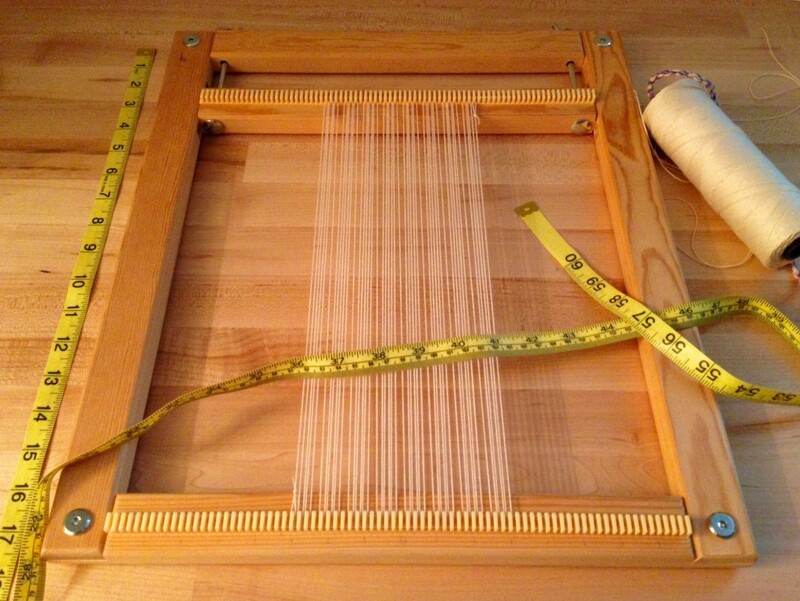 My practice won’t make me perfect, but it does provide a way for me to grow as a weaver. Faith is more than a belief, it is a practice. Faith in Jesus is always the entrance door into the Kingdom of heaven. And don’t think of heaven simply as a destination. Think of heaven as a Kingdom where everything is right. The day will come when that Kingdom is no longer a mystery. In the meantime, let’s practice weaving worthwhile cloth. May you practice what you believe. It’s wonderful to hear of your journey with fibers. I love finding out about another kindred heart! So glad you are here! Honestly, I did not set out to create an optical illusion with this small tapestry diary. Reds, pinks, and whites seem like stylish colors for the month of Valentine love. My primary intention with this piece was simply to work on varying angles and shading. Tapestry diary hangs on the wall, making it easy to remember daily tapestry practice. An instrument not in a case is always more likely to be picked up for fun, which is practice in disguise. Your style shows how you want others to see you. But your heart tells the inside story of who you are. I may be focusing on what clothing and accessories to wear, thinking of colors and shapes; meanwhile, my heart is putting hidden things on display. The hidden person of the heart is who you really are. Let people remember you by your internal person more than by your external appearance. Then your chosen colors will simply enhance the true picture of you. May you fascinate others with your inner beauty. Check out my Etsy shop for some new items. You’ve seen the pot holders and rag weave table runner here: Textured Textiles for Christmas. Lovely weaving and what a nice little loom! I’m a bit NW of you but still in TX… I’m enjoying reading your blog. Hi Kathyo, it’s nice to have a fellow Texan stop in and say hi! Such a nice little loom. What make is it? Thanks, the sturdiness is what took my eye. 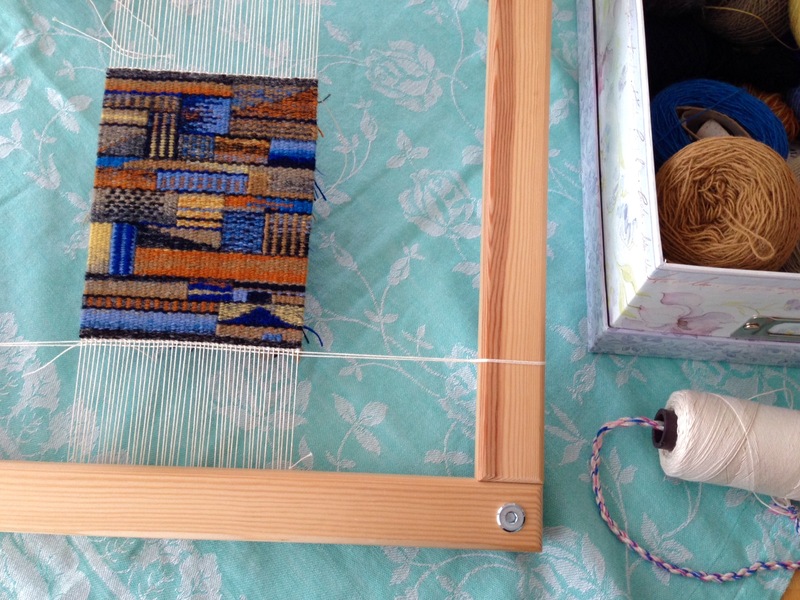 On a whim I bought Tapestry Weaving by Glasbrook, but I don’t have a loom! 🙂 Do you like the tensioning device on the Freja? I have been reading Not Like the Lilies which is an ethnographic type description of the Doukhobors, their journey to Canada, and their textile traditions in Canada. 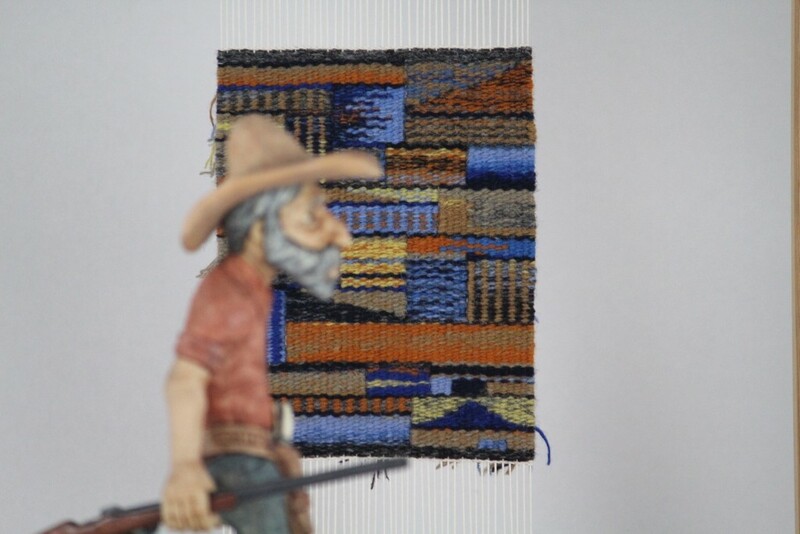 According to the book, they commonly wove edgings on a floor loom in tapestry style. The book is informative if you like the history of textiles or reading about the practices of different cultures. I can see why you want a loom to go with that book. Haha. Glasbrook does an excellent job of explaining basic techniques. I really like her book! Great pictures, too. Yes, I do like the tensioning device on the Freja. 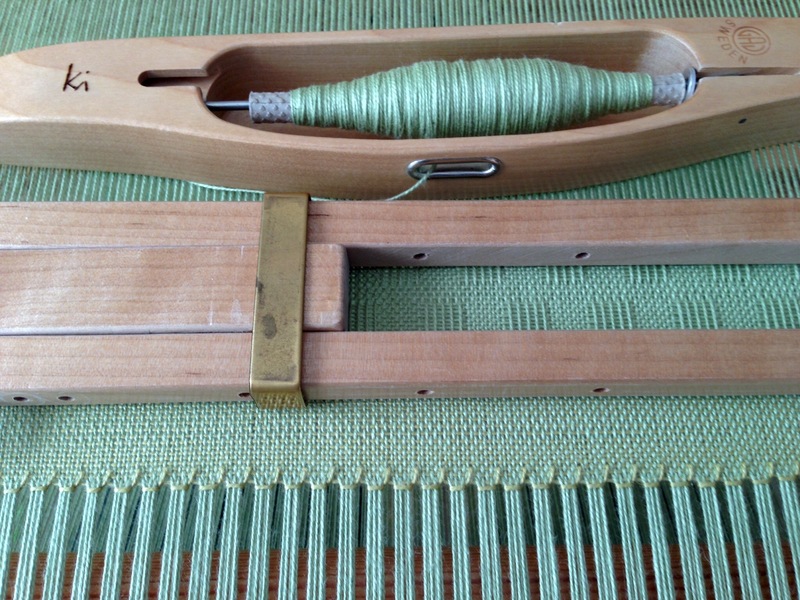 It makes it very easy to tighten the warp–a little, or a lot. I haven’t had any problems with it. Not Like the Lilies sounds like a very interesting read. Thanks, I’ll look it up. I’m always interested in learning about practices of different cultures. That’s fascinating to me. Heads up for Friday’s post (2/27/15). 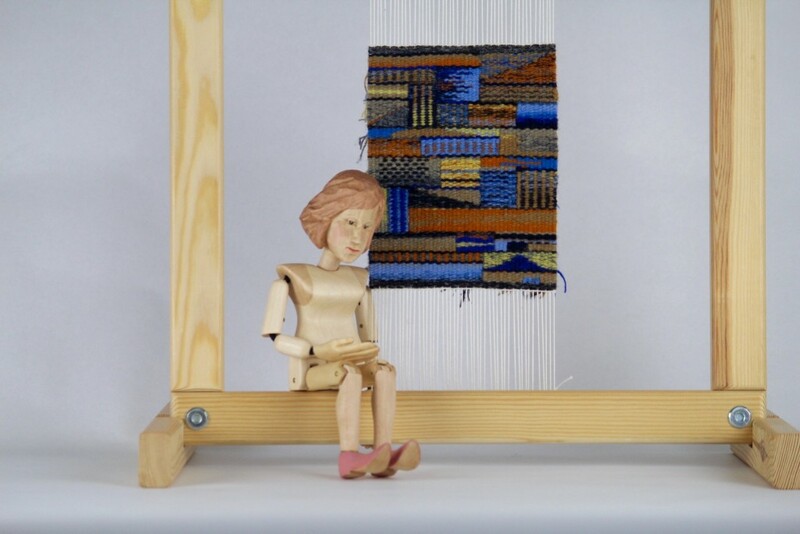 It’s more about the tapestry diary on the tapestry frame. The author of the book is Dorothy K. Burnham. I have two other of her books, but just happened to read the one I mentioned first. Another of hers that I have is Cut My Cote, which as a weaver , may be of interest to you. She gives diagrams for how different groups in Eastern Europe, Western Asia, and the Far East made very efficient use of their cloth, yet their cloths are more than just a sack (think kimono). I bought the books hopping to be able to adapt some of the ideas for my use. 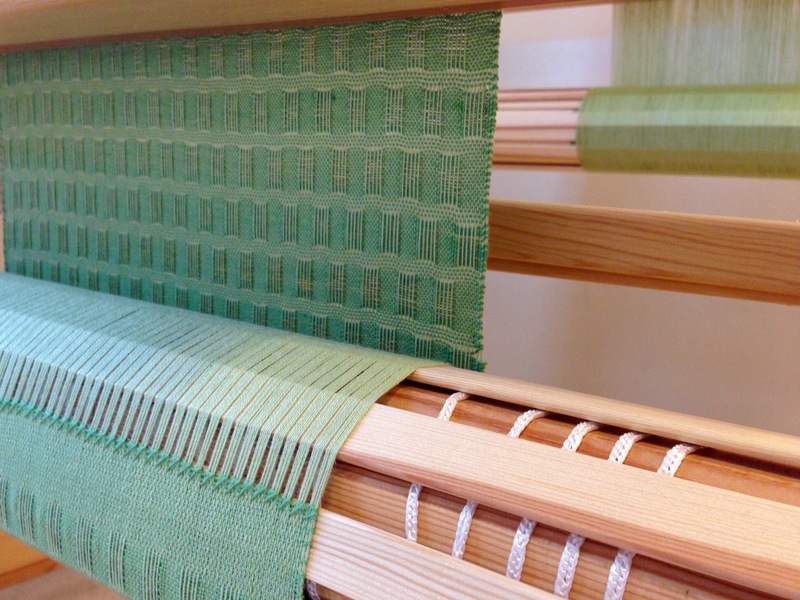 Warping slats on the cloth beam, the first time around, give the fabric a smooth surface to roll onto. 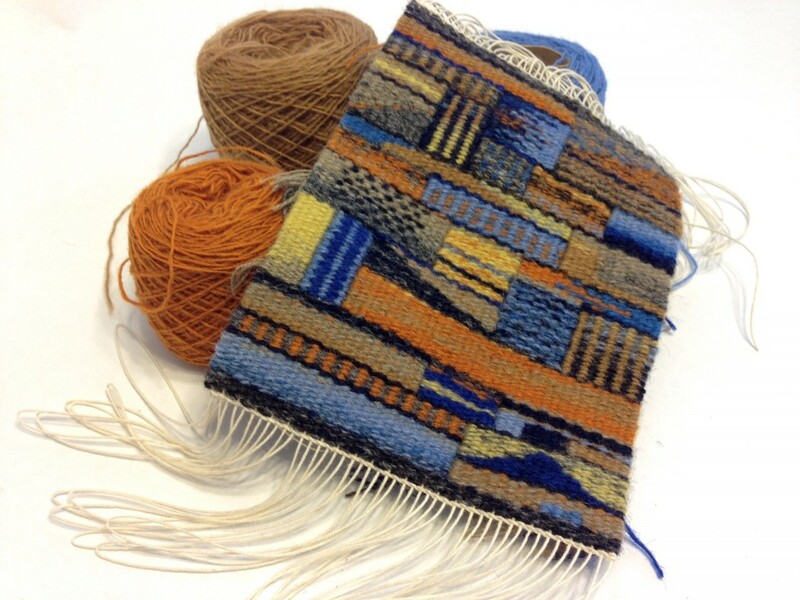 Hemstitching separates the fringe area from the woven cloth that will become a scarf. Some things you wish for are simply out of your control. That is how I felt two weeks ago when my mother went to the hospital with life-threatening illness. Wishful thinking is nice, but it doesn’t actually change anything. Prayer does change things. I’m not saying that prayer will necessarily keep someone alive if their body has worn out. I am saying that prayer makes a difference in how things play out in any circumstance. Things happen when you pray. In this case, my mother beat the odds and left the hospital. Alive! You and I need each other. When we humble ourselves and ask for help, help comes. When we pray and ask God for help, sometimes sick people get better, and weak people get stronger. Our prayers for each other are heard and answered. This is better than wishes come true. May you have the benefit of someone else’s prayers. Such great news!! Enjoy your dear Mother as long as you can! Liberty, Thank you for being one of those who prayed! And thanks for the hug. Remember this linen dice weave fabric? 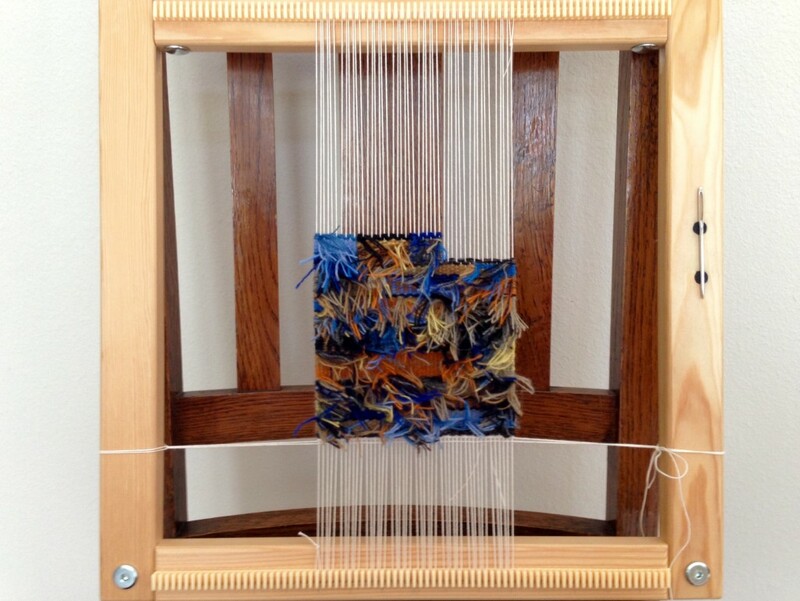 The brown checks are sets of weft floats over the deep blue warp. 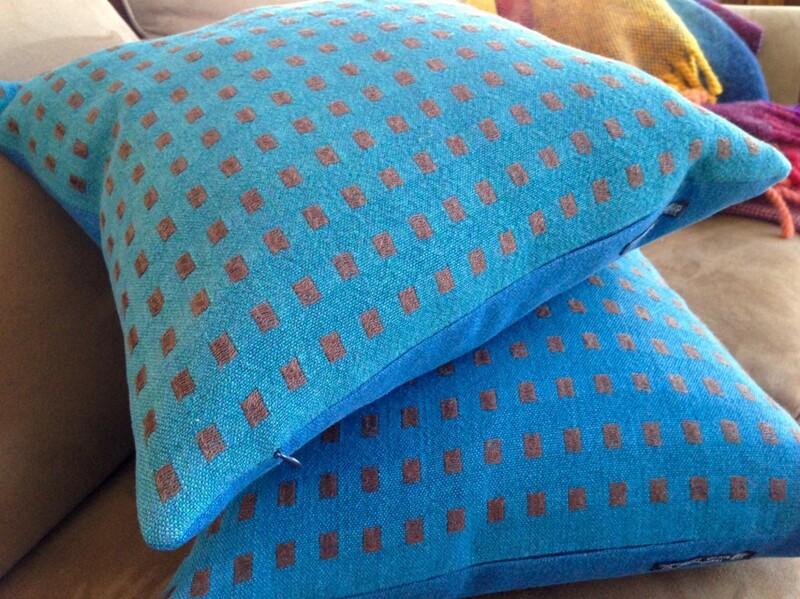 I created two throw pillows with this striking linen fabric, and filled them with down and feather inserts. An invisible zipper makes a classy closure for a pillow like this. If you do it just right the little zipper pull is the only clue that there is a zipper in the seam. Fabric this special deserves a classy closure. 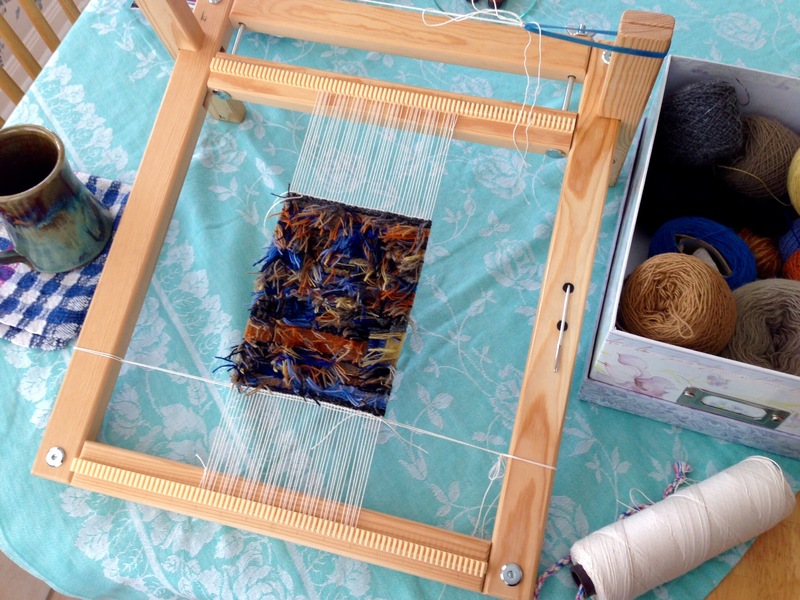 Three different weft colors–deep blue (same as warp), royal blue, and teal blue– produce three similar, yet slightly different colors of cloth. 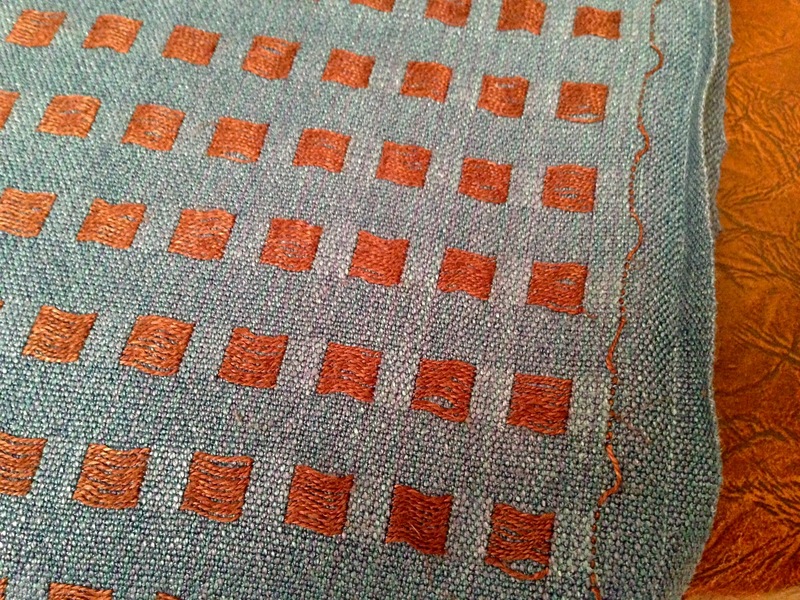 The brown linen floats create an interesting checked texture. If you know the zipper is there, it is not hard to find. But if you are not looking for it, you could miss the invisible zipper, especially if it is inserted by an expert seamstress. Have you thought about noticing other things that are not immediately visible? Invisible zipper placed in bottom seam of linen pillow cover. 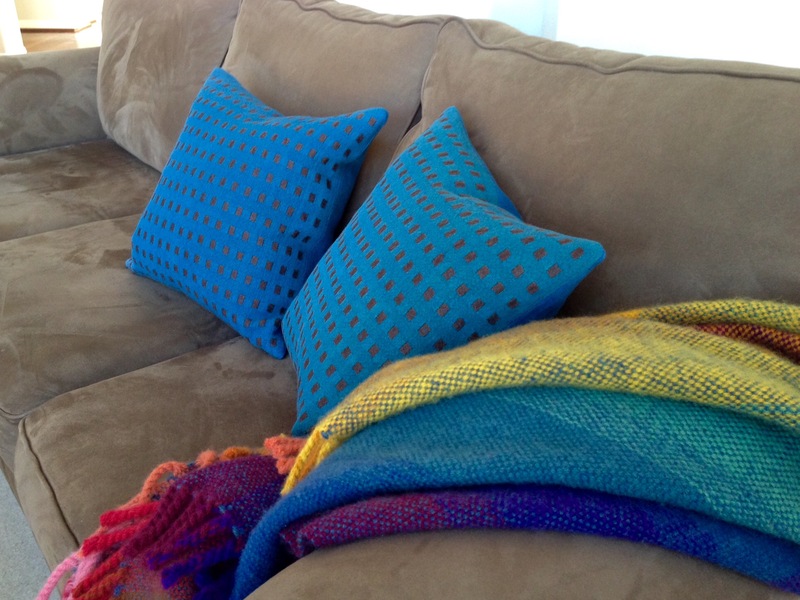 Linen dice weave pillows take their place on the sofa. Faith is seeing the invisible. Faith is assurance that our hope is sound, and conviction that the unseen is true reality. As with the zipper, when you know the invisible is there, it is not hard to find. May you notice details that are easily overlooked. Karen, would you be willimg to share the draft? We are in Santa Fe at the moment and those are exactly the colors I saw when I walked out the door. Lovely! Hi Joanna, how fun that you saw the same colors! You must have a way of noticing your surroundings. Nice! 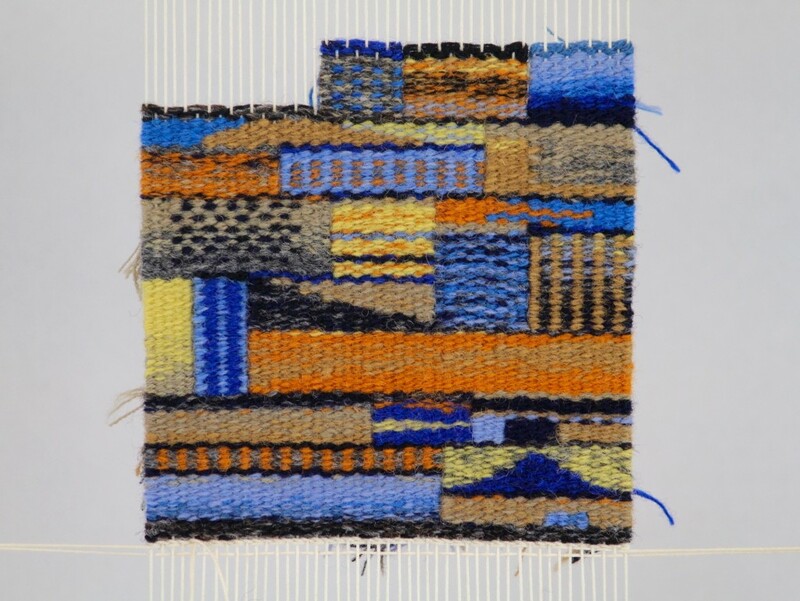 I’m away from home right now, so I can’t tell you page number, but this draft is from my favorite weaving resource, “The Big Book of Weaving,” by Laila Lundel. 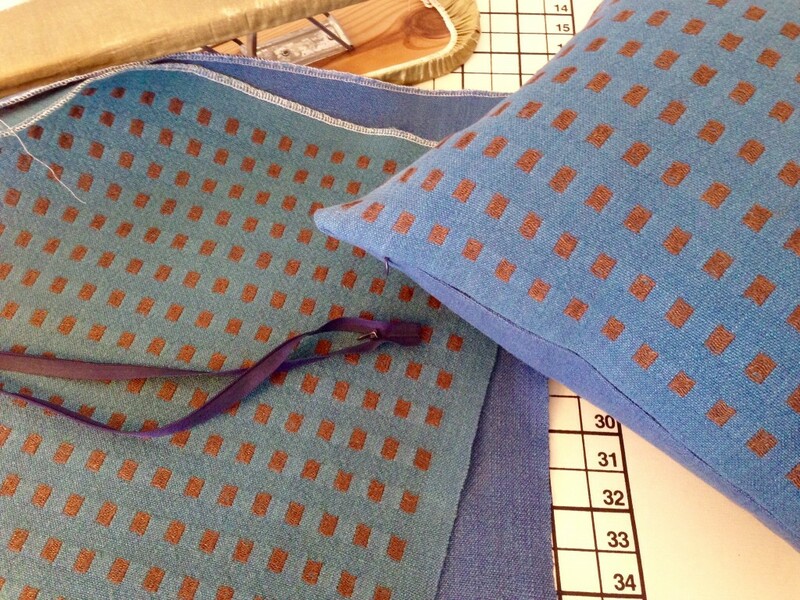 I just discovered this post and see that you did make pillows of this beautiful linen fabric. So you didn’t have a problem with the floats on the back, but could you tell me what the back looks like? Hi Pat, I did not have any trouble with the floats on the back. The floats on the back are not really much longer than the floats on the front. I will post a picture of the back later, so you can see it. Hi Pat, Here’s a picture of the back side of the dice weave fabric. You can see it is not much different from the front side. The pattern floats are only slightly longer on the back. You can see where the thread is carried up the side on the back, too. thanks so much. This relieves my concerns about the floats on the back. I don’t think I can carry the thread up the back as you did because I am planning to do it as a table runner. I also thought I would vary the color of the floats, so I guess I should just end the lpattern thread at the end of each pattern block. I think it will be stunning if you vary the color of the floats. You will need to be inventive, perhaps, in securing the ends as you change colors. That may be a little tricky, but I’m sure you can do it!